Even though it is a good thing, Canada is not normally famous for its disasters. Yes we’ve had the Halifax Explosion, Hurricane Hazel and the Winnipeg Flood of 1950 but they don’t come that often. These past few weeks were a rare exception as Canada had three sudden disasters to deal with. 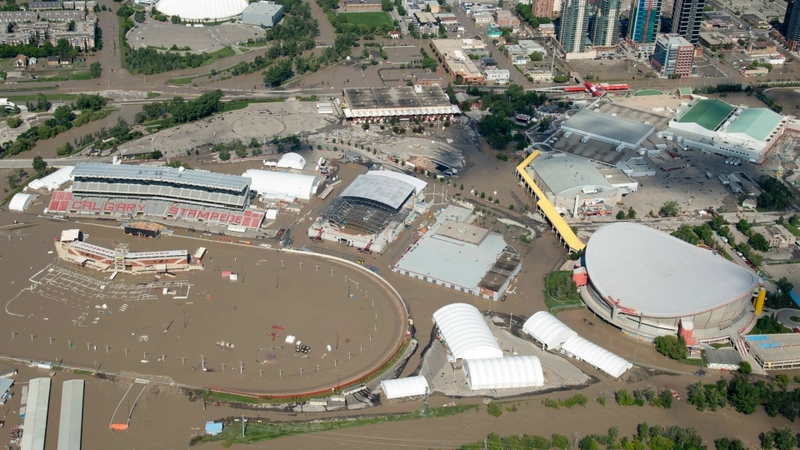 Much of Calgary’s downtown including the Stampede racetrack and saddledome was flooded out in the worst flooding in Alberta’s history. Alberta’s rivers are not known for their floods. However heavy rainfall throughout the province of Alberta from June 19th to 22nd led to the worst flooding in the province’s history. Seven major Alberta rivers including the Bow and Elbow Rivers were filled hard and were over flooded to the point they caused huge damage to surrounding cities. The damage done to the city of Calgary received the most coverage especially since the flooding damage hit the downtown core bad. That and the fact that the annual Calgary Stampede was about to start. The stampede grounds endured considerable damage. Even venues like the Scotiabank Saddledome reported flooding up to the tenth row. In fact 26 surrounding neighborhoods around the Calgary area were placed under a mandatory evacuation order for three straight days. The 75,000 evacuees made it the largest evacuation in the city’s history. It wasn’t just Calgary. The town of High River had to evacuate. The Siksika First Nation east of Calgary had to declare evacuation. Even towns of Banff and Canmore had to be cut off after floods and mudslides cut off much of the Trans-Canada Highway. Even cities like Lethbridge, Red Deer and High River had to declare their states of emergency. The flooding resulted in four fatalities in total. The towns and cities continue their clean-up in the aftermath. One thing that did happen is that the Calgary Stampede went on as planned. Events planned for the Saddledome however were either cancelled or relocated to other locations in the city. Soaking wet Go Train passengers are rafted to safety during a surprise flash flood in Metro Toronto. Monday July 8, 2013 was expected to be like any other day in Toronto. If there was to be a thunderstorm, it was expected to be brief and pass by. However the afternoon provided some of the most serious thunderstorm activity faced by Toronto. Rain was delirious. Rainfalls ranging from 97mm in downtown Toronto to 126mm at Pearson Airport caused major flooding in many areas including the freeways and the subway stations. 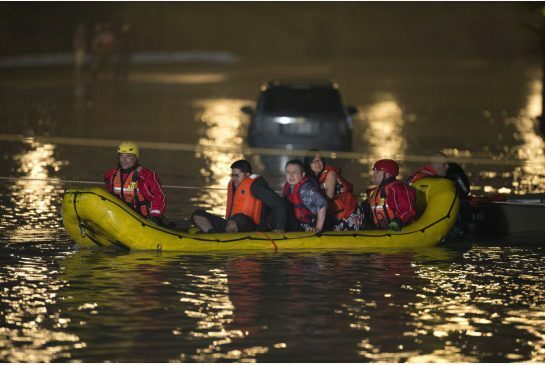 In fact news images showed a GO train with 1400 people that was caught in the floods. Power outages were rampant as 80% of Mississauga was without power as was 300,000 other people who received Toronto Hydro. A big surprise for a city that normally gets an average of 74mm of rain in the whole of July. Fortunately the floods have subsided and fortunately there were no fatalities. I saved to worst for last. Until a week ago, Lac-Megantic was a simple small town in Quebec close to the Canada/U.S. border. Since the early morning of Saturday July 6th, it’s the centre of possibly the biggest train accident of the year and continues to make more bad news with each day. It was a simple train trip done many times before: a trip transporting oil from the United States to New Brunswick. 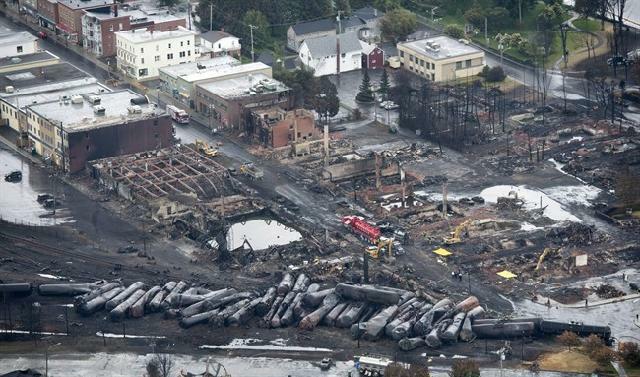 Lac Megantic was just simply a town where the train was to pass through without disturbance or incident of any kind. The train set consisted of 72 tanks each filled with 113,000 litres of crude oil and had been transferred from train system to train system. Burned out buildings and burned out oil tankers lay in the aftermath of a train derailment in the downtown of Lac-Megantic, Quebec. Two hours before the incident while the train was parked in Nantes, the engineer left the train as he was done his shift. He felt however that it was unsafe since it was spitting oil and thick black smoke and wanted to call an American official about directives for the situation. Actually drivers who were driving along the train 40 minutes earlier complained of thick black smoke coming from the train. The Nantes Fire Department put out the blaze at 11:30pm and the train company employees confirmed the train was safe. However one failed to notice that the locomotive was tampered with. The train tanks, detached from the locomotive, started moving downhill at witnesses considered a dangerous speed. Then the unmanned train derailed in an area of downtown Lac Megantic, the tanks collapsed spilling crude oil on the ground and cause a huge fire 91 to 121 meters in diameter. Between four to six explosions were heard and heat from the fire could be felt as far as two kilometers away. Over 1000 of the town’s 6000 residents had to be evacuated. People in the third floor of burning buildings jumped to avoid being caught in the blaze. Even as of now, there are no final statistics and new information is being gathered every day. 35 people have been confirmed dead but 15 remain missing. Thirty buildings in the downtown of Lac Megantic have been destroyed by the blaze. Information has surfaced that the locomotive is believed to have been tampered with. I’m sure more clues will come up in the future. -The province of Alberta has started to create new flood-mapping standards such as categorizing high-risk flood areas. Some homeowners in high-risk areas are offered to move from their current location with financial assistance from the province or risk being ineligible for any future Disaster Recovery Fund assistance. Homeowners will be given new regulations in the future such as notating homes for sale being in a possible flood-risk zone. Even developers will be made aware of high risk areas. -The City of Toronto will have to do some rethinking and reassessing certain aspects of the city. Especially the drainage system. Also Toronto transit will have to organize a better system of escape from its trains and subways to avoid a worse scenario. One thing is train riders who had to travel on the still-wet trains the following day were given a $100 credit to cover whatever dry cleaning costs. Hydro One had most of its equipment underground. It will soon review its standards and practices in the aftermath including bringing some equipment above ground. -Once the clean-up and other activities from the Lac Megantic derailment are completed, you can be sure there will be a full inquiry on this incident. Even without the death count being finalized, this has already become the deadliest train accident in Canada since 1864. Montreal, Maine and Atlantic Railway (MMA) will definitely face the biggest heat from this as well as Transport Canada. Already the Transport Safety Board of Canada has started an investigation on this. The Red Cross has started emergency efforts in the town. Lac Megantic will have to make efforts to rebuild and have makeshift locations for businesses that used to exist before the disaster. You can be sure that certain people will be prosecuted for criminal negligence and the government agencies will set new regulations for dealing with petroleum-filled tanks. It is a shock to see all of this happening in Canada in the span of one month’s time but it was possible. Nevertheless it is Canadian nature to take immediate action towards something like this. In fact a roof collapse in an Ontario shopping mall last year that caused the deaths of two people made national news and brought fast action. In some countries, you’d need a bigger fatality result to get major action happening. Only time will tell what the end results are and what actions come of these incidents. 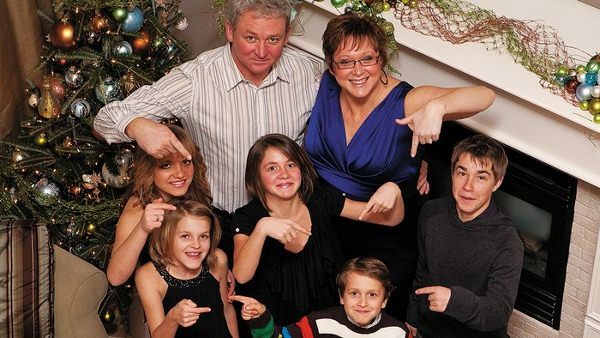 The Wards and their five adopted children are the focus in the documentary High Five. High Five is a documentary filmed over a five-year period. It’s a story about international adoption and about a couple’s iron will to let their heart win out over politics, finances, and inter-family strife in their attempt to adopt and parent five Ukrainian siblings. We don’t get what we expect to have but we do get an eye opener on the subject of international adoption and the lives of all seven. We first meet Cathy and Martin Ward, a couple from Surrey, BC who’ve always wanted children. A car accident to Cathy ten years earlier to which she constantly needs operations for even now makes pregnancy very risky. They first decided to play host to a 7 year-old Ukrainian orphan named Alyona in 2006. During the visit, they learn that Alyona have additional siblings. They bring Alyona with her next oldest sibling Snezana the next year. The following year they visit all five at the orphanage in Gorodnya, Ukraine. They decide to adopt all five but laws allow them to only adopt two at the time. They first adopt Alyona and Snezana but promise the other three–Older siblings Yulia and Sergey and youngest sibling brother Sascha–that they will adopt them the following year. Politics delay the adoption of the other two siblings for years. After much struggle–political, financial and emotional–the three other siblings are finally adopted. Problem solved, right? Not completely. Even before the full adoption process we learn of potential problems that could arise. The five come from an abusive household in Ukraine where their mother died and their stepfather was an abusive alcoholic. It took the courts to remove the children from the stepfather and put them in the orphanage. All five remember the abuse very well. The gap between the two adoption periods also has an effect on the siblings too as there’s a sense Yulia has lost some feelings to the two others. One thing to keep in mind is that Yulia, the oldest daughter of the five, acted as the mother figure to her four younger siblings in the orphanage. There are also the health problems of the two. Martin is a nurse at the BC Children’s Hospital but Cathy needs frequent surgery from her car accident and Martin has a bout of the flesh-eating virus. Sergey himself has a growth stunt that has slowed his growing down to which he’s only 4’6″ at the age of 17. The adoption process is also a financial risk. The process was very costly and Martin would have to take a nursing job in the territories to help make finances more manageable. Then there’s the fact that the siblings are growing up. There’s always growing pains and approaching adulthood for some. Even Sergey returns to Ukraine temporarily for better job opportunities. The biggest difficulty appears to be the relationship of the family with Yulia. Yulia has always been a sensitive and emotional girl. Since the adoption, Yulia would now have to go from the mother-figure to the parented. This does not fit well with her as she’s so used to being the mother figure. Her relationship with Martin is mostly unaffected but it’s sour with Cathy. The bad vibe also doesn’t go well with the other siblings as they find her hard to stand, even Sergey whom she’s always been the closest with. On top of it, she’s a growing girl who’s graduating from high school, working a job, has a boyfriend and is entering adulthood. She had made two trips to Ukraine both for employment purposes and to meet with another sibling of theirs who was adopted by a Ukrainian family. The documentary ends with Yulia still in Ukraine. She still has a negative attitude: “I have no mother.” The other four are still seen being parented by Martin and Cathy. The documentary ends with the six on a local snowboarding trip. As Martin looks out to them as they’re having fun, we’re left wondering what he’s thinking about as he watches them. As for the documentary’s ending, it ends with a ‘to be continued’ ending. It leaves off in the present as the continuing story that it is and leaves one asking questions. Will Yulia return to the family? Will the five be one again? Will any of the other sibling try to pursue opportunities in Ukraine? Those are questions only time has the answers for. This documentary is a good example of international adoption and how it doesn’t always worked out as wished. It didn’t have a completely happy ending nor did it have a tragic ending. It just presents the story as is and is able to balance the positive aspects with the negative aspects. As I just said, this documentary ends without a real ending. It’s a story that continues to this day with the cameras no longer rolling and will have changes to the lives of all seven over the years. Nevertheless I wish the Wards and the five all the best in the future. Directors Yulia Ivanova and Boris Ivanov did a very good job of filming this story which appears to be like a daily or yearly chronology of the adoption story over the five-year period. Even though most of the documentary is narrated by Martin, the story is seen through a wide variety of angles: both the parents and the siblings themselves. There are moments when it’s about the family and moments when it’s about one individual. They give the right focus for each situation. Sometimes they try to be mediators in this situation by attempting to help the interviewed subjects by giving advice behind the camera. That doesn’t become a weakness for the documentary. This documentary does give a feel of being like a reality show but this is not a ‘reality show’ as one would commonly associate with popular reality TV. There’s no sensationalism or explosive brattitudes. This is a real situation with real human emotions present and real problems and crises arising in the adoption process. This is another documentary that’s meant more for the television than for the big screen. The fact that it’s produced in association with the Knowledge Network is the best example of why. From what I heard at the screening, it will be shown on The Knowledge Network in British Columbia in December. I have no information about whether there will be a DVD release for it. I feel it’s worth a DVD release since this is good teaching material. Those interested in international adoption will get a good experience to what it’s like and the potential risks that lay ahead. High Five is as much a documentary that tells a story as it teaches. It presents a common story of international adoption that presents the viewer with the stories of the individuals as much as it does with the family. It’s worth watching.